The Ohio State women’s soccer team (5-1-0) put up a tough battle against Notre Dame (3-2-2) in a double overtime thriller at home Friday and came out victorious, defeating the Fighting Irish 2-1 in the 105th minute when Notre Dame put a goal in its own net. The winning goal came from a failed clearance of senior forward Sammy Edwards’ shot, which spun backward and sailed into the back of the net to conclude the game. 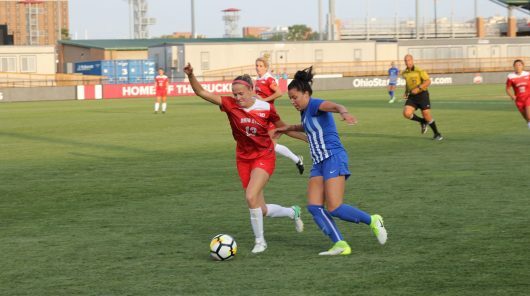 Before the final goal, the Buckeyes’ offense continued to press, determined to take home its fourth consecutive victory. Though Ohio State may have lucked out with the Irish’s own-goal, it didn’t discredit the talent of their opponent, or the drive and determination of their own team. Wolcott put the Buckeyes on the board, scoring the initial goal for the team in the 14th minute. The goal was set up by a lofted corner kick from senior defender Nikki Walts and was buried by a header from Wolcott just six yards inside the post, giving the Buckeyes an early 1-0 lead. This resulted in Wolcott’s first goal of the 2017 season, and the seventh of her career. As the first half progressed, the Irish were able to break down the Buckeyes’ back line, which ultimately lead to a Notre Dame goal from sophomore forward Natalie Jacobs in the 39th minute. Jacobs was able to finish the rebound from a save by junior keeper Devon Kerr and tie up the game before half time. As the game remained a tie at the end of regulation, Walker-Hock knew adjustments were necessary as her team went into overtime. In an effort to improve its performance, the team reevaluated their initial game plan and discussed what they were doing that wasn’t working, and what it needed to do help defend better and work as a team, Wolcott said. Ohio State’s adjustments were successful in leading them to a win against a challenging non-conference opponent. The last time the Irish played the Buckeyes on in Columbus was on Oct. 1, 1995, when Notre Dame beat Ohio State 2-1 in overtime. The Buckeyes are set to take on St. Joseph’s at home Sunday at 1 p.m. to conclude their non-conference run.